There were some artists of yesteryear who created a truly unique sound, and made music that was without parallel (for better or for worse). Names like Washington Phillips—who played what he called a “manzarene”, possibly two modified zithers played simultaneously, to accompany his sanctified singing—come to mind. In this case (partly because I don’t have any of Mr. Phillips’ records), we’ll look at the Golden Melody Boys, a truly obscure duo whose sound was aptly characterized by Tony Russell as “a bubbling sixteen-string polyphony.” While I count eighteen (the American tiple has ten strings), they certainly made music like no other that I am aware of. The Golden Melody Boys—Dempsy “Demps” Jones and Philip Featherstonhaugh (or “Featherstonehaugh”, or “Featherstone”)—were a musical duo hailing from Ceder Rapids, Iowa. Demps was born on November 9, 1890 in Fountain Run, Kentucky; Phil on November 4, 1892 in Illinois. Phil could play a mean mandolin, and Demps was skilled on guitar, banjo, and the rather out-of-the-ordinary tiple. Aside from their musical proclivities, Dempsy was the Linn County Recorder, and worked variously on the side as a baseball player, a newspaperman, in construction, and for Quaker Oats. Phil, apparently, was more or less of a bootlegger. They were playing together as early as 1925, and played on Earl May’s KMA in Shenandoah, Iowa, as well as a number of other stations. 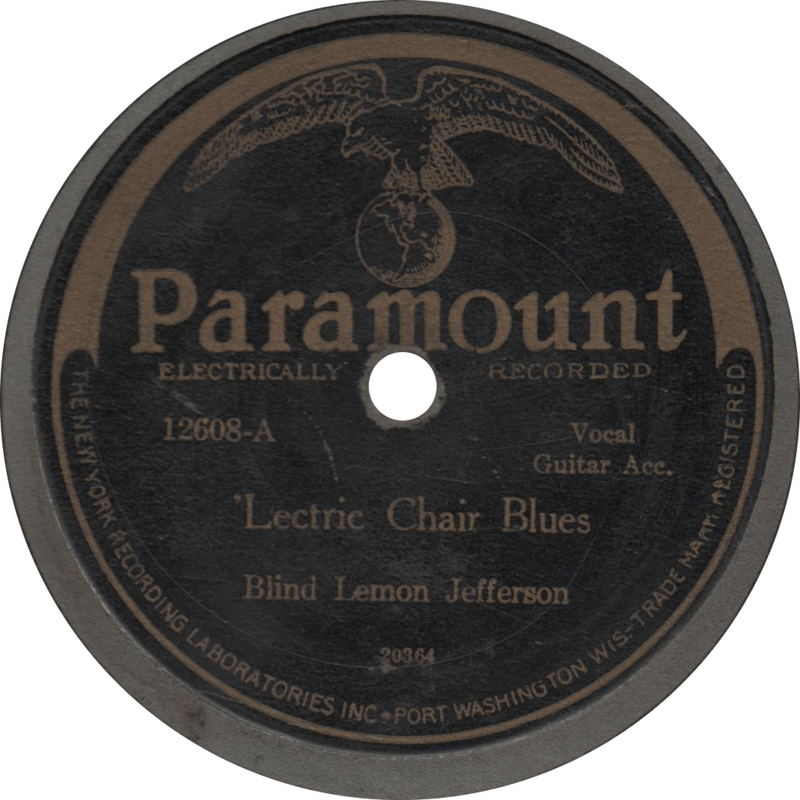 They made their recording debut in October of 1927 for the New York Recording Laboratories (makers of Paramount, Broadway) in Chicago, and cut a total of eighteen sides for them over the following year, all of which but one were released. Dempsy followed up with six solo re-recordings of earlier titles for the Starr Piano Company (for their Champion and Superior labels) on November 19, 1931 in Richmond, Indiana. Jones stayed in Iowa, starting a family band in the 1930s which apparently continued all the way into the days of television, while Featherstonhaugh moved west. Jones died on April 10, 1963 in Cedar Rapids, Iowa, and Featherstonhaugh on March 1, 1969 in Beaumont, California. As of late, their “Gonna Have ‘Lasses in de Mornin'” made its way into PBS’s grand project American Epic. 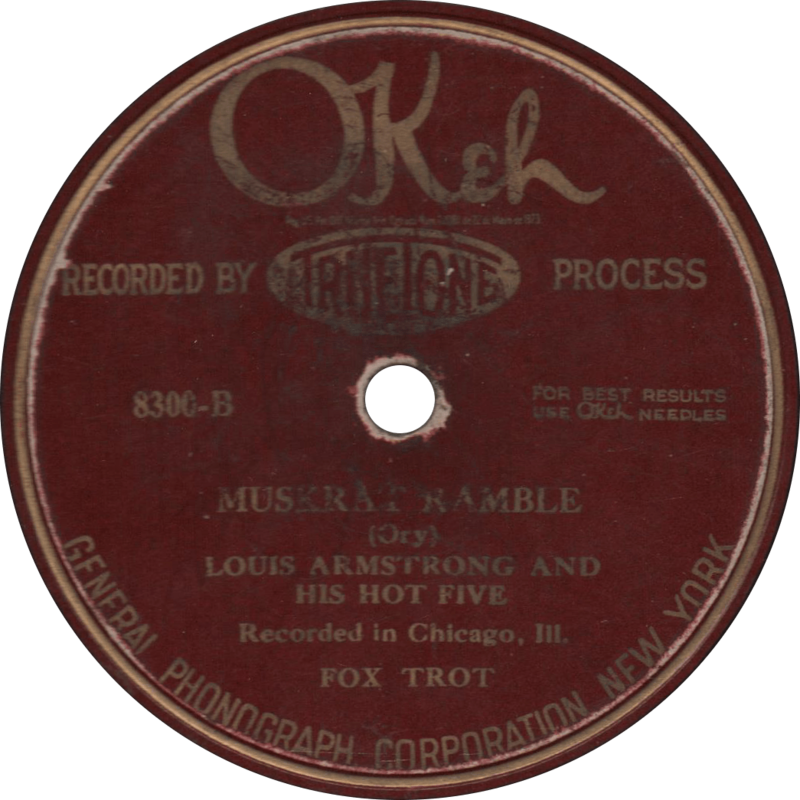 Broadway 8089 was recorded circa October of 1927 in Chicago, Illinois. The Golden Melody Boys (here under the rather thin pseudonym “Georgia Melody Boys”) consist of Demps on tiple and Phil on mandolin. Demps provides the vocals. It was their first released record, and was also issued on Paramount 3068. Jones recorded both these songs again in their 1931 Gennett session. “My grandfather’s hat was too big for his head, it was caused by drinking Milwaukee beer,” is the first line in “The Old Tobacco Mill” (a parody of the old “My Grandfather’s Clock”), and is just the sort of whimsical, often nonsensical lyrics that characterize the bulk of the Golden Melody Boys’ recorded output. 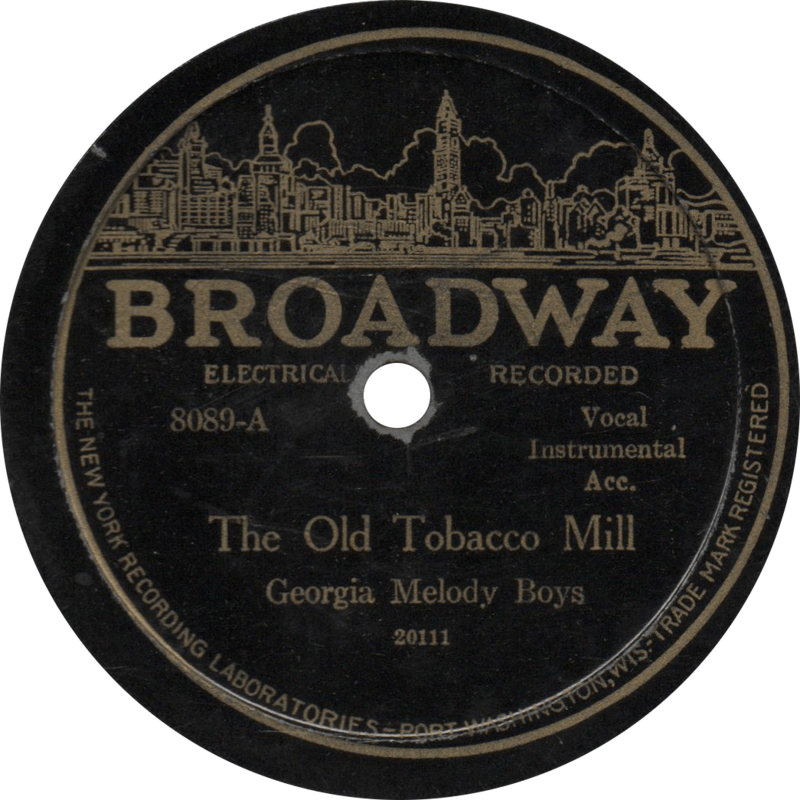 The Old Tobacco Mill, recorded October, 1927 by the Georgia Melody Boys. On “The Cross Eyed Butcher”, we’re treated to two stories for the price of one, first that ot the titular butcher, then of a fellow’s dental follies, with a nice little instrumental break in-between. Demps’s vocals rather remind me of Frank Crumit, who—incidentally—was also a tiple player. 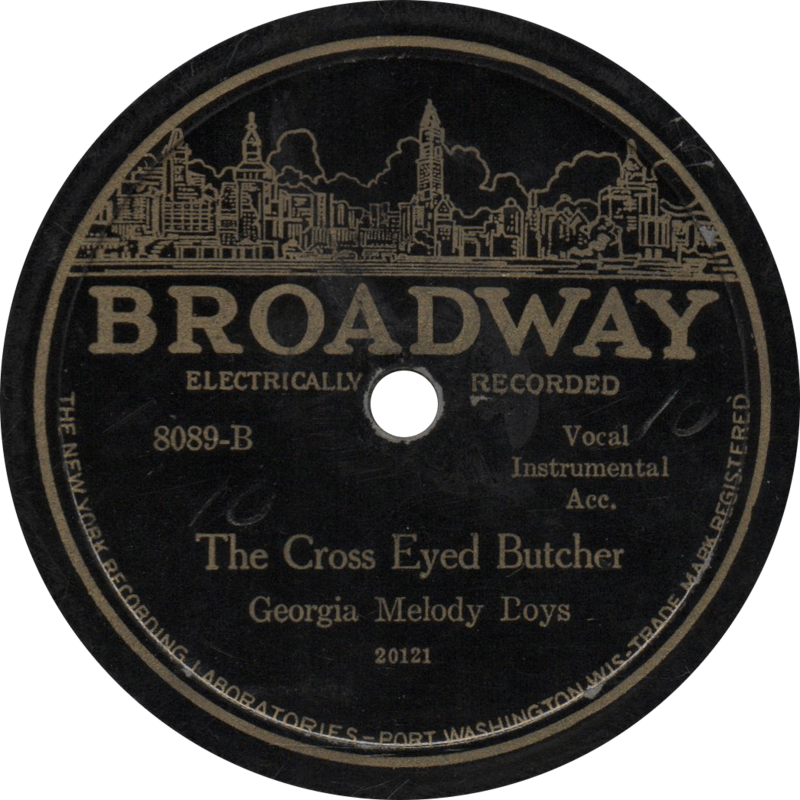 The Cross Eyed Butcher, recorded October, 1927 by the Georgia Melody Boys. Milton Brown was one of the founders of that marvelous fusion of hot jazz and hillbilly string band music that we now call western swing, yet a tragically early demise led his name into near-obscurity today. Not only did Brown’s music lay the foundations of western swing music, it also served to inspire such subsequent luminaries as Django Reinhardt. William Milton Brown was born in Stephenville, Texas on September 7, 1903 to Barty and Martha Brown, a family of poor sharecroppers. Ma and Pa Brown determined that Milton and his sister Era would get an education to live a better life, and so they did. Singing old standards and church songs, Milton’s musical talent showed itself at an early age. Tragedy struck in 1918 when his sister died, and the Browns relocated to Fort Worth. Milton finished high school late, as helping to support his family made his attendance sporadic, and after graduating, he pursued a career in music. In 1927, he sang in a local group called the Rock Island Rockets, and his younger brother Derwood soon joined him on guitar. Nonetheless, Brown made his living as a cigar salesman until the Great Depression left him unemployed. Brown’s big break came in 1930, when he crossed paths with the Wills Fiddle Band at a dance in Fort Worth and joined in a chorus of the “St. Louis Blues”. Leader Bob Wills was impressed and asked him—and his brother Derwood—to join the band. After a stretch on Fort Worth’s WBAP as the “Aladdin Laddies,” the Wills Fiddle Band was contracted by W. Lee “Pappy” O’Daniel of the Burrus Mill and Elavator Company of Saginaw, Texas, producer of Light Crust Flour, thus becoming the first generation of the prolific Light Crust Doughboys. In 1932, the Doughboys cut two sides for the Victor Company in Dallas, as the “Fort Worth Doughboys”, producing one of the finest—and earliest—western swing records made. Not too long after, Milton had a spat with Pappy, and left to form his own band: the Musical Brownies. For the Brownies, Brown hired jazz musician Bob Dunn, the first player to electrify his steel guitar, and fiddlers Cecil Brower and Cliff Bruner. Their regular spot was the Crystal Springs Dance Pavilion in Fort Worth, buy they also toured Waco, Corsicana, Weatherford, and Mineral Wells. They’d a play a hot tune, then follow with a waltz to let the dancers cool off. After two 1934 sessions for Bluebird, the Brownies secured a spot on Decca Records’ roster, which produced a string of successful records. Tragically— perhaps as much for the world to be deprived of his talent as for his own misfortune—the end came too soon for Milton Brown when he fell asleep behind the wheel while driving a young lady home one night, and wrapped his car around a telephone pole on the Jacksboro Highway. Although he was expected to make a full recovery from the accident, Brown died of pneumonia on April 18, 1936, at the young age of thirty-two. Decca 5070 was recorded on January 27, 1935 at the Furniture Mart Building at 666 Lake Shore Drive in Chicago, the Brownies’ first Decca session. Brown’s Musical Brownies consist of Cecil Brower on fiddle, Derwood Brown on guitar, Ocie Stockard on tenor banjo, Bob Dunn on his famous electrified steel guitar, Wanna Coffman on string bass, and Fred Calhoun on piano. Milton, of course, sings the lead vocals, with Derwood and Dunn backing. First up is Milt’s recording of the tune that launched his career, W.C. Handy’s “St. Louis Blues”. A signature piece, at the Crystal Springs Dance Pavilion the Brownies were known to stretch this one out to a full fifteen minutes. Even limited to a three-and-a-half minute phonograph record, Brown makes a tour-de-force performance out of it. Make note of Bob Dunn’s idiosyncratic steel guitar solo. 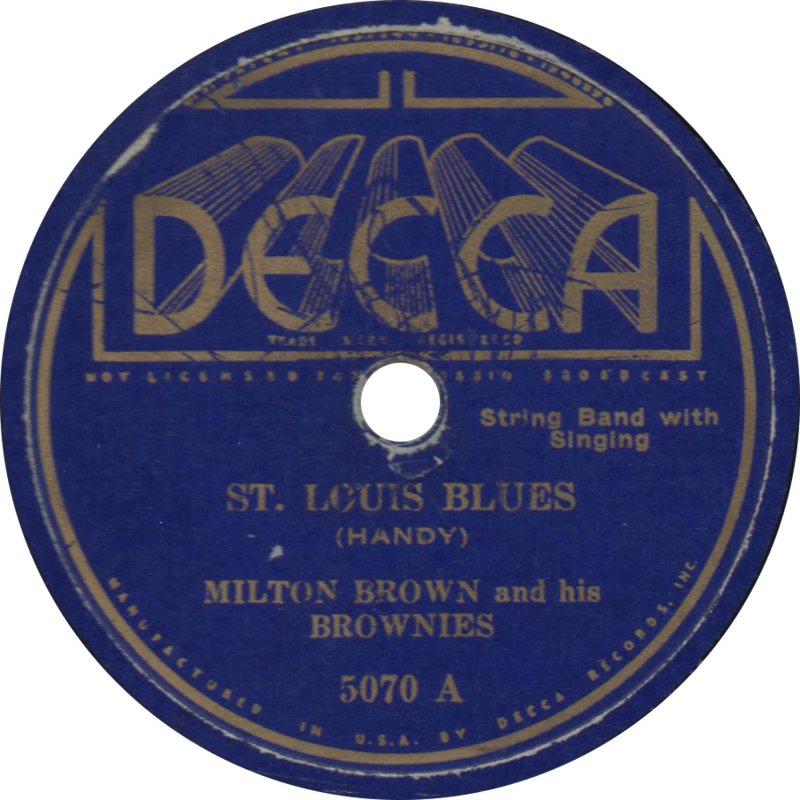 St. Louis Blues, recorded January 27, 1935 by Milton Brown and his Brownies. Next, the Brownies swing Eddie Green’s blues standard “A Good Man is Hard to Find”. 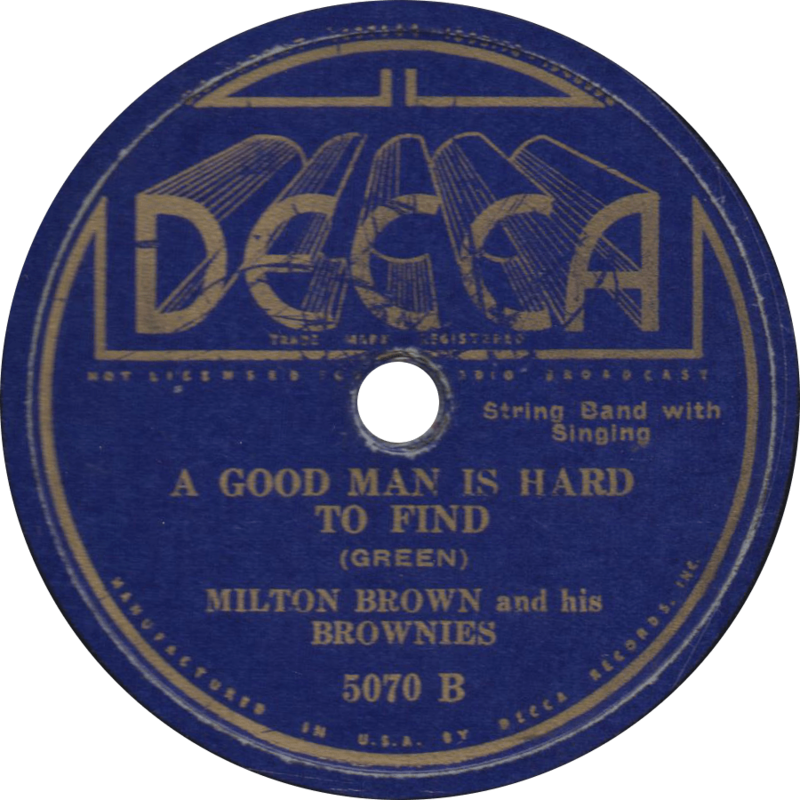 A Good Man is Hard to Find, recorded January 27, 1935 by Milton Brown and his Brownies. 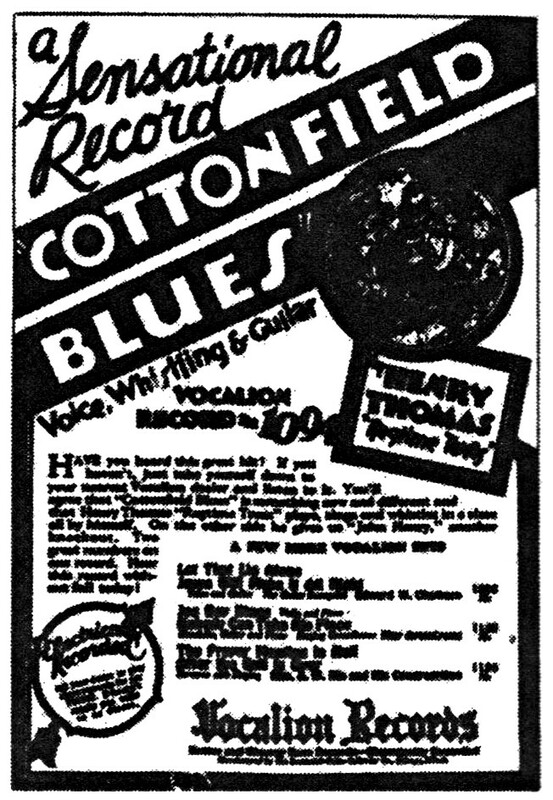 An advertisement for “Cottonfield Blues”, as reprinted in The Devil’s Music, 1976. One of the great figures of country blues, one of those who have attained a near legendary status, is Henry Thomas, also known by the nickname “Ragtime Texas”. 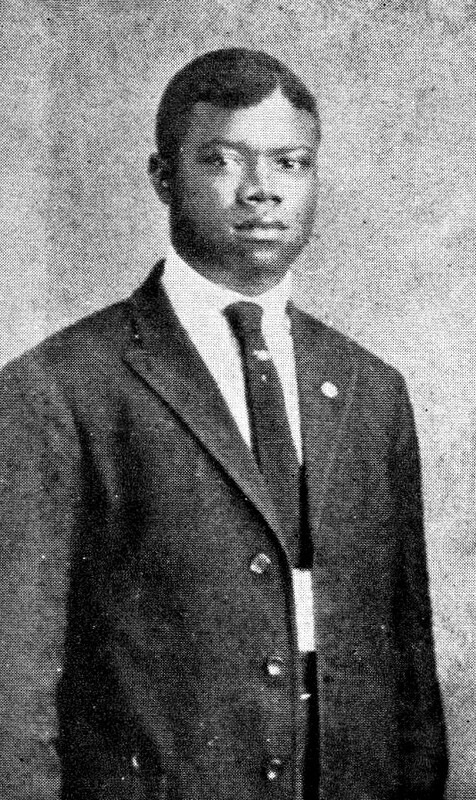 One of the oldest rural black musicians to record (though probably not the oldest—Daddy Stovepipe was purported to have been born seven years earlier), Thomas predated contemporary songsters like Jim Jackson, Lead Belly, and Charley Patton as well as many fellow Texas musicians such as Blind Lemon Jefferson and “Texas” Alexander. Henry Thomas is said to have been born in 1874 in Big Sandy, Texas (which in spite of its name is neither big nor particularly sandy), one of nine children in a family of sharecroppers; his parents were former slaves. In his youth, he determined that he was not to live his life as a farmer, and turned to the life of a songster. He left his home around the time he was sixteen, and lived the life of a hobo and itinerant musicianer. Thomas learned to play the “quills” (an instrument much like panpipes), and later the guitar to accompany his singing. Like any songster worth his salt, Thomas learned to play a variety of styles from minstrel songs, to folk ballads and blues, to rags and dance tunes. His music earned him the hobo nickname “Ragtime Texas”. On the Texas & Pacific and M-K-T lines, Thomas hoboed all around Texas and the South (much of which he outlined in his “Railroadin’ Some”), bringing his music with him and expanding his repertoire all the way. He sang of his home state of Texas, of his life as a hobo, and plenty more. His travels likely brought him to the World’s Fairs of Chicago and St. Louis in 1893 and 1904, respectively. 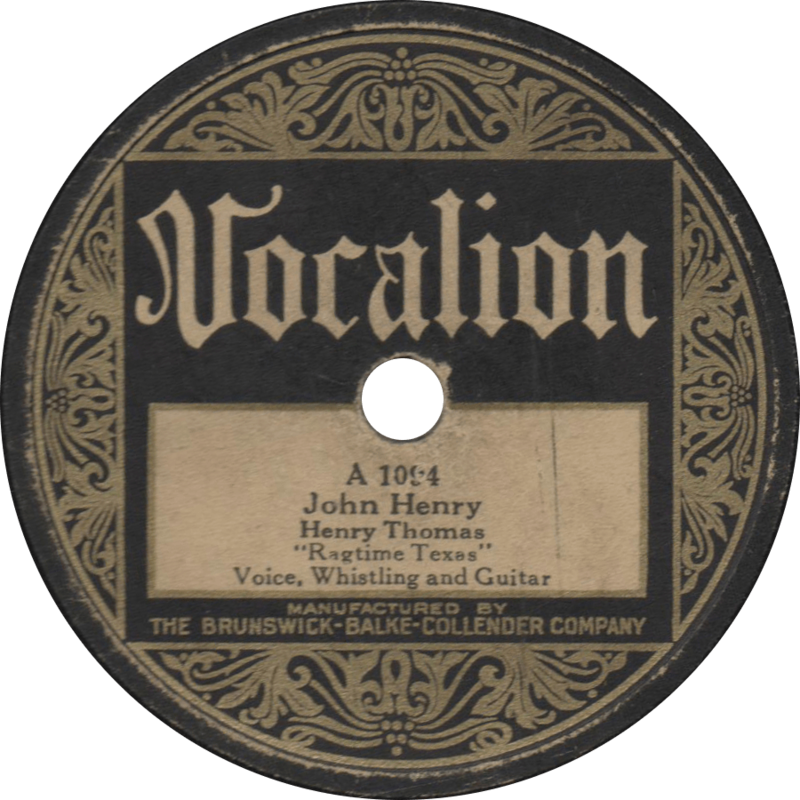 In 1927, Thomas traveled to Chicago to cut a record for Vocalion, recording four sides, of which three were released. Over the following years, he returned to Chicago for five further sessions, netting a total of twenty-three titles from 1927 to 1929. Little to none of what happened after his final recordings is known. 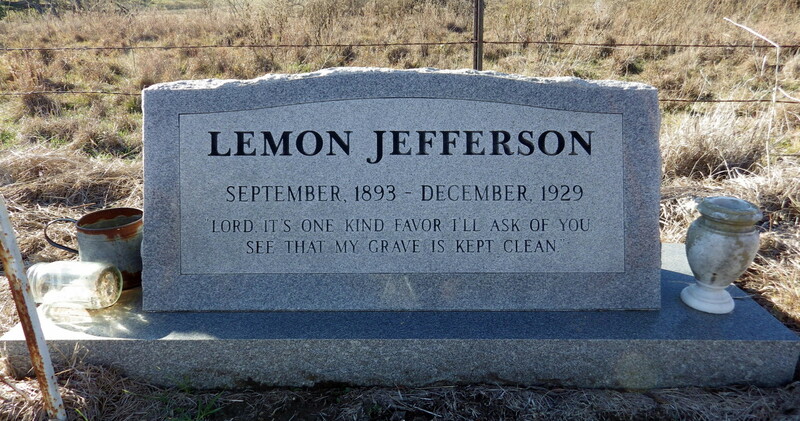 Many sources claim that he died in 1930, but others claimed to have seen him in Houston in 1949, and around Tyler, Texas in the 1950s. Long after the end of his life, Thomas’ “Bull Doze Blues” served as the primary inspiration for the band Canned Heat’s 1968 famous hippie anthem “Going Up the Country”. 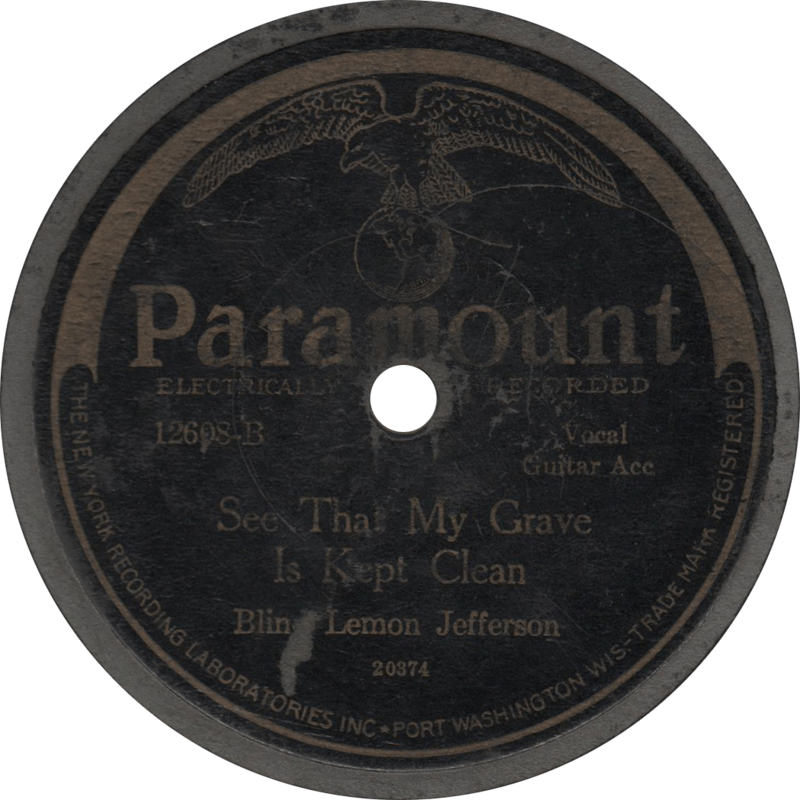 Vocalion 1094 was recorded on June 30, 1927 (other sources suggest a date of April 19 or July 5 of the same year) in Chicago, Illinois. 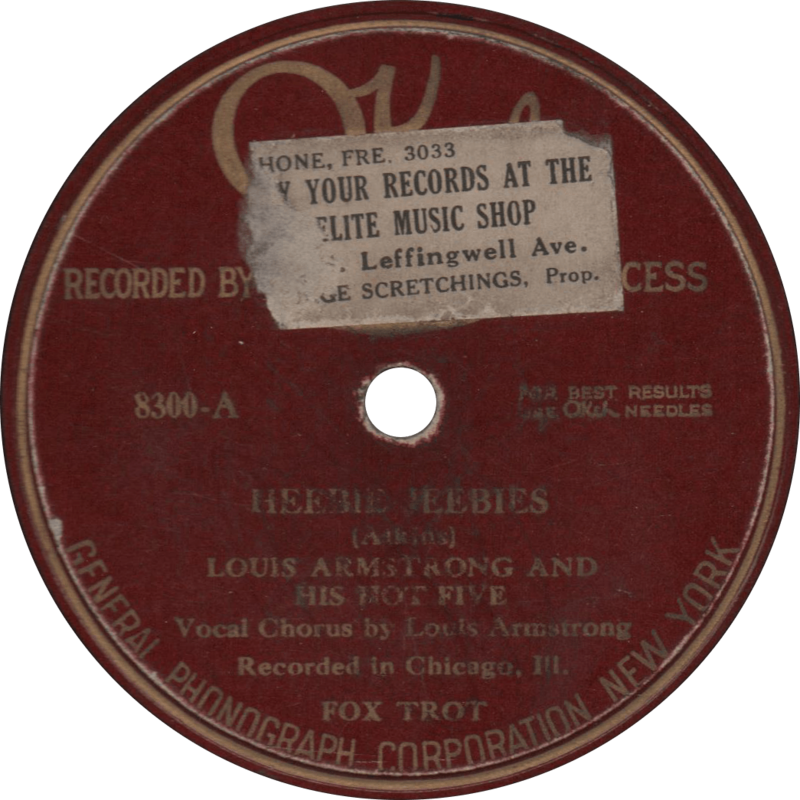 It is Henry Thomas’ first issued record, and, aside from an unissued cut of “The Fox and the Hounds”, his first recorded sides. First, Thomas sings and whistles his fantastic rendition of the perennial folk ballad “John Henry”, putting his own unique spin on the tale of the legendary steel driving man. 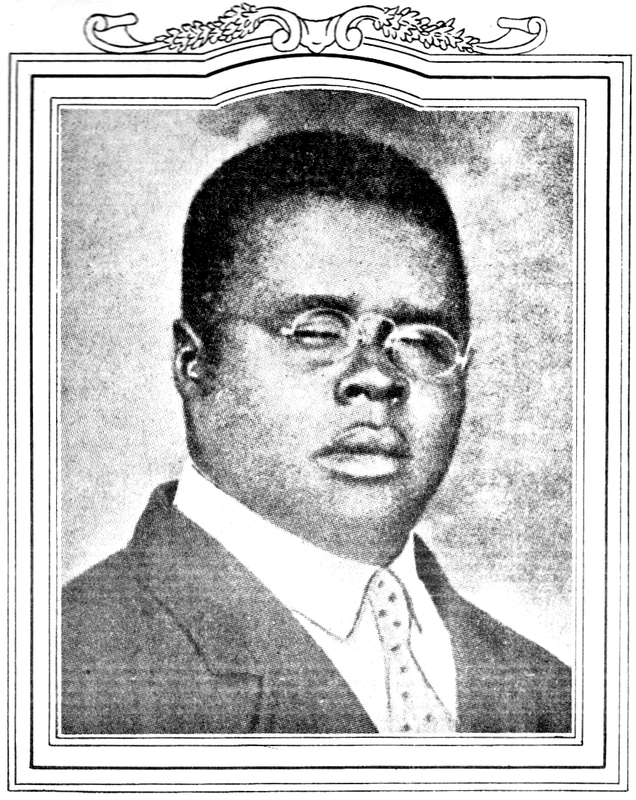 John Henry, recorded June 30, 1927 by Henry Thomas “Ragtime Texas”. Turn the record over and Ragtime Texas next delivers a driving performance on “Cottonfield Blues”, bearing some musical resemblance to the “Hesitation Blues”. Unusual as Thomas music is—what with the quills and the droning guitar—I can’t get enough of it. It’s truly entrancing, wondrous music! 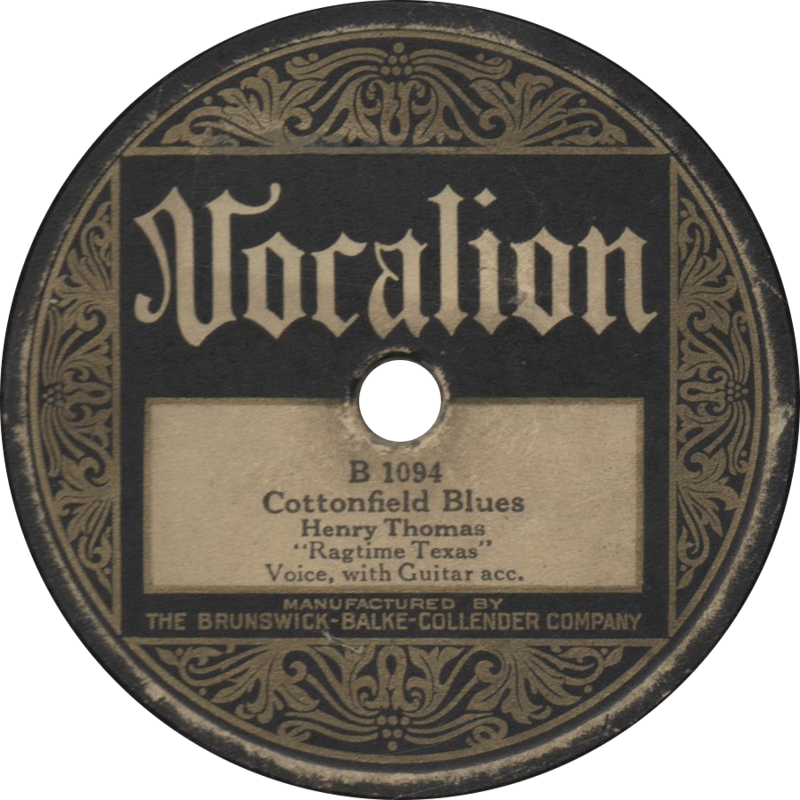 Cottonfield Blues, recorded June 30, 1927 by Henry Thomas “Ragtime Texas”. Dad went out in a Ford machine. He dropped a match in the gasoline. He went so high, he’s never been seen.